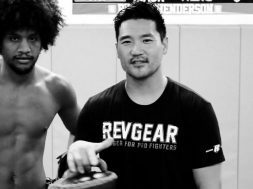 Our video MMA technique tutorial series continues with MMA Pad Work Master Eddie Cha, head coach at the LAB Arizona, with a guest appearance here from UFC feather weight “Bruce Lee Roy” Alex Carceres. In this video Eddie and Alex demonstrate a pads drill using REVGEAR’s famous light weight curved Thai Pads. Coach Eddie describes the purpose of the drill is aiming at building co ordination that culminates in a full drill with the kick pads. The drill starts with Alex Carceres firing a rear leg roundhouse kick where he then retracts the kicking leg and immediately steps forward towards his opponent (or pad man in the case of the drill) and fires a knee with the same rear leg he kicked with. Listen closely to Eddie’s tips on how he holds the pads in this situation as the devil is almost certainly in the detail here. Coach Eddie gives some great tips on how the pads should be held during this drill including doubling up the pads and also mentons detail on the timing used with your partner. Be careful to pay attention to the advice on positioning Eddie gives as well as the option of also incorporating a Thai belly pad. The Drill progresses adding in a lead hooking punch followed up with a further rear leg roundhouse kick which could be aimed to either the head or the body depending on the situation. The full drill is a combination of four strikes, kick, knee, hook and kick. Finally Eddie shows how this drill can be broken into different sequences with what he calls “trigger points”. Using this simple four shot combination its possible to build a full round routine that truly sharpens the strikers skill set for Mixed Martial Arts competition. 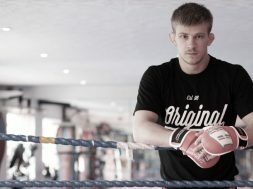 previous MMA GLOVES - WHATS BEST FOR MMA TRAINING?